Amanda Chase’s face lights up when she talks about crafts, pottery, and yoga classes. But what she loves most about PEP is being with her friends, she said. She works at Carrabba’s Italian Grill, rolling silverware. (It’s fun, and she gets to meet lots of people.) She also participates in an enclave, working at Osprey Village Thrift Store every Wednesday. (Enclave is a fancy word for small groups who receive on-the-job training at area businesses with a vocational instructor and supervision.) Current employers (or enclaves) include Reilley’s North End Pub, Carrabba’s Italian Grill, Hilton Head Hospital, and Osprey Village. Additionally, PEP contracts with other community businesses on an as-needed basis for job orders that include bulk mailings, collating, and light packaging. Ericha Doubles likes participating in CrossFit classes and is particularly fond of the rowing machine. She works every Friday at Osprey Village Thrift Store, helping with cleaning and other tasks. She and her fellow members are excited that the bookmobile is coming today. Mathieu Rocca is an Elvis Presley fan and a walking encyclopedia of Elvis trivia, according to his cohorts. He likes bowling and swimming and has goals for improving his athletic performance in the coming year. He works competitively at McDonald’s two days a week, meaning that he is an employee of the company and is paid the same wages as his co-workers who perform similar tasks. He also volunteers at Carrabba’s, Hilton Head Hospital, and Reilley’s. Corey McCall, who suffers with a painful bone disorder in his hips, has recently lost 100 pounds by drinking a gallon of water a day, being disciplined with his diet, and walking. Without the extra weight to carry, he’s getting around. He rides the Palmetto Breeze bus by himself to and from the PEP facilities on the island and in Bluffton and will soon be getting his own apartment, where he will live independently. He works competitively at Carrabba’s. Fast forward an hour, and I am at PEP’s satellite location in Bluffton, where ceramic instructor and artist in residence Kara Artman is assisting members as they paint their most recent pottery projects. Members introduce themselves, stand and shake hands and express pride in their artistic abilities. Finished pieces are on display in the storefront and are as beautiful as any you would find at a gift shop or retail pottery outlet. “Not only is this a fun recreational activity for our members, but also a vocational endeavor, because they sell their work and are paid,” said Steve Maglione, PEP’s executive director. The ceramics program is a micro-business, operated by PEP, which allows members to be compensated for their work, he explained. PEP Lawn and Home Care is another micro-business that offers members an opportunity to work for wages and serve the community. Recent estimates in the United States show that about one in six, or about 15 percent, of children ages 3-17 years have one or more developmental disabilities. Developmental disabilities are a group of conditions due to an impairment in physical, learning, language, or behavior areas. These conditions usually last throughout a person’s lifetime. As they reach adulthood, young people with such disabilities also reach a crossroads in care. As children, they have relied on their families and the school system for support. But what happens next is critical. 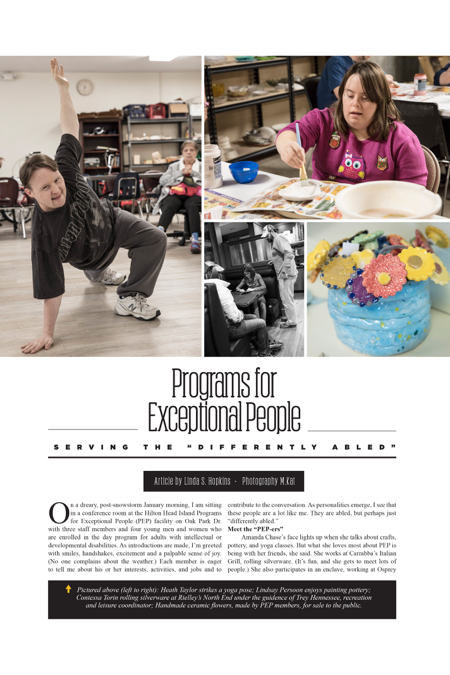 Programs for Exceptional People (PEP) is a 501© 3 organization that is committed to providing services to adults (ages 21 and over) in southern Beaufort County, S.C., whose lives are affected by lifelong intellectual and developmental disabilities. Incorporated as a nonprofit organization in December 1995, PEP is a qualified provider through the South Carolina Department of Disabilities and Special Needs (DDSN). According to Maglione, the program is currently serving 60-70 individuals, ages 22-88. While PEP members differ individually in the levels and types of support needed to perform daily living activities and interact with the world, like everyone else, they have a basic desire for friendship, social interaction, leisure activities, and satisfying work. Given the opportunity, they are capable of leading rich, meaningful lives and making valuable contributions to society. And by having the outside support system, parents and other family members are also able to continue working and contributing to the world at large. According to Dr. Carol Myers, vice president of PEP’s board of directors, without the local program, many of their members would be stranded at home, sitting in front of a television. Instead, they are actively engaged in the community, developing skills, holding jobs, volunteering, and socializing. In addition to work opportunities, PEP has always provided a range of recreation and leisure activities. Thanks to dedicated staff and many community volunteers who organized, led and helped chaperone activities, in 2017, members participated in bicycling, cheerleading, dance, exercise, equine therapy, fishing, golf, music, yoga and more. In the evenings and on weekends, members attended local festivals, theater, sporting events and movies. They also visited the South Carolina State Fair and the Jacksonville Zoo. Contribute: PEP receives less than 50 percent of its operating revenue through local, state, and federal sources. The remainder of the funding must be achieved through grant writing, successful special events, corporate and civic sponsorship, and individual donations. PEP is planning to launch a capital campaign with a goal of securing land and constructing an off-island facility that will accommodate the growing community in Beaufort and Jasper counties. Your generosity will go a long way in serving PEP participants. Donations can be sent to 10 Oak Park Drive, Box 2, Hilton Head Island, SC 29926. Volunteer: Whether you are a teacher, a potential intern, a crafter, a retiree, or a stay-at-home parent, there is a volunteer position available for you at PEP. Full-time, part-time and occasional volunteers are needed to help, particularly with activities and outings after hours and on weekends. Contact Trey Hennessee for more information: trey.hennessee@pephhi.org. Employ/Shop: Local businesses are invited to partner with PEP by employing members independently or through enclaves. For information, email Steve Maglione: smaglione@pephhi.org. Purchasing items crafted by PEP members also helps perpetuate the programs and services. Decorative and functional pottery pieces are available for purchase in the retail storefront at Pep’s Bluffton facility, located at 163 Bluffton Road, Suite E., or at the Bluffton Farmers Market. Some items are also sold at The Greenery on Hilton Head Island and at Aunt Laurie’s in Bluffton. Everyone experiences limitations in one form or another, and we all have special needs. Inclusion isn’t just about tolerating differences. It’s about making sure your attitudes don’t limit the potential of other people. You can help change the conversation by choosing to see the ability in people, no matter what their difference. I would highly encourage you to spend a day volunteering at PEP or observing members as they go about their daily tasks within the community. When you have had that experience, you will know three things for sure: 1) The world is filled with good people doing good things; 2) People are more alike than different; and 3) Life is good—no matter what the weather. For more information, please visit pephhi.org or call (843) 681-8413—HHI or (843) 837-8415, Bluffton ceramic store. Great! Thank you for all you did to educate people not familiar with PEP and promote community awareness and acceptance of our Special adults! We would love to have you both be our Guests at the PEP GALA at Sea Pines Country Club, September 8th, 2018. I will get back to you as we get closer to the Fall Gala.